Beautiful figure of a lady with Gown and Hat, South Italian, ca. 4th.-3rd. century BC. Nice larger fragment the lower part missing and mounted to a nice wooden mount costumized for the figure. Size: 22 cm. high when mounted. A rare intact ancient Roman glass bottle, dating 1st.-3rd. century AD. An interesting and quite scarce type with 4 high relief ribs in the body, a smooth large neck, turned over rim and a round, slightly concave base. Condition: Superb for this large fragile type, perfect with fine irridescence. The Bottle with a completely round body a medium long flaring neck and a slightly flattened base. Condition: Superb, finely preserved sound glass and with a wonderful irridescence. Size: ca. 16 cm. tall. Finely shaped vessel, hemispheric body, a short neck and turned-over rim and foot ring. Condition: Superb, finely preserved sound glass and with a wonderful blue silver and rainbow iridescence. Size: ca. 7,5 cm. tall. The head with grotesque features of an African Nubian man with tungue protruding, made in the Late to Greek Period, ca. 3th.-1st. century BC. Condition: Fragmentary finely preserved facial features. A very nice and cute Pilgrim Flask, Coptic Egypt, early-mid 1st. millenium AD. 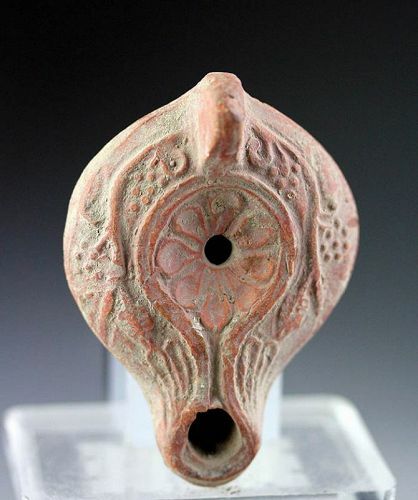 The pottery Flask in terracotta finely made, two small stylized feet, two handles and with a Cross shaped pattern on both sides inside a circle. Condition: Nice, small chip to the edge of the top. Dionysos/Bacchus related Roman pottery Oillamp, foot mark with toes! Highly interesting Roman pottery Oillamp with a makers mark of the Foot with destinct toes, 1st. century AD! Beautiful fine quality piece decorated with wine and grapes, central rosette, knob handle. This Makers mark was used in the later part of the 1st. century AD, but it's the first time we've seen it with distict toes as well. Condition: Superb, sharp, better than pictures. Condition:Choice, some wear to handle and decoration, but intact. Early Roman Pottery Oillamp with Teatre masks, central workshop! Condition: Choice and intact, better than pictures. 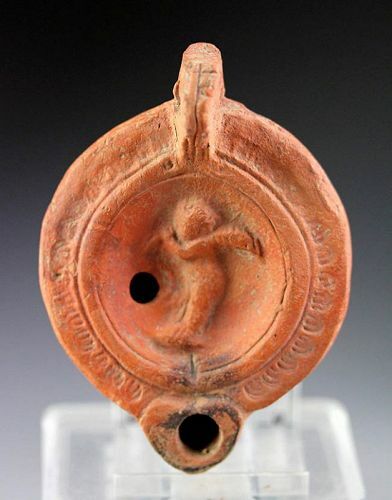 Early Roman Pottery Oillamp with Leda & Swan - gem!! Superb lamp with a very sharp face, showing the myth of Leda & Swan with some great details. The lamp is of the Loeschcke Typus VIII and made in very high relief. Condition: Choice and sharp for this ellusive type, better than pictures. Nozzle repaired. A very attractive compact Roman Glass bottle in bluish green glass, ca. 3rd.-4th. century AD. Bell-shaped body and a long neck and flaring mounth. Very heavy and sound glass! Very beautiful thin irridescence, with som colourful rainbow patches that photos can't do real justice. Just a beauty! Size: 85 mm. tall and 57 mm across the base. A Rheinland-Pfalz private collection, 1970-1999. A fine pair of Roman Gold Earrings, dating ca. 2nd.-4th. cnetury AD. These earrings are matching, and made with small curving shields as decoration. Size: 12 mm. for each. These earrings are not matching, but both very nice! Both elaborately decorated with stylized grapes and granular decoration, wire etc. Size: 23 mm. and 20 mm., combined weight 1,87 grams. Ancient Gold pendant with the original garnet, dating to the 1st.-3rd. cent. AD. Fine amulet drop-shaped with a loop and a central garnet. Condition: Choice, fine gold patina and intact. Scarce and beautiful gold pendant, Roman, 1st.-3rd. century AD. The pendant crescent shaped with a larger loop of gold tread. The body is decorated with fine engravings.